Dr. Gary Pollack has been selected to lead The University of Toledo College of Pharmacy and Pharmaceutical Sciences. 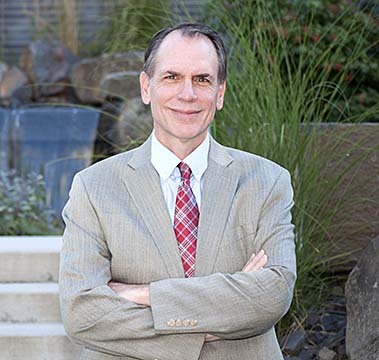 Pollack will join the University with more than 30 years of experience in higher education, most recently at Washington State University, where he has served as dean of the College of Pharmacy since 2010. His appointment will be effective Aug. 15. “I am excited that Dr. Pollack will be joining us here at The University of Toledo. He is a respected scholar and successful leader who brings a notable breadth of experience that will benefit the college and the University as we continue to move forward,” said Dr. Karen Bjorkman, interim provost and executive vice president for academic affairs. Prior to joining Washington State, where he also serves as a professor in the Department of Pharmaceutical Sciences and was the university’s vice provost for health sciences from 2011 to 2013, Pollack spent 26 years at the University of North Carolina at Chapel Hill. He served as UNC’s executive associate dean of the School of Pharmacy, chair and professor of the Division of Pharmaceutics, and chair and professor of the Division of Drug Delivery and Disposition (formerly Pharmaceutics). His research is focused on how drugs and toxicants affect the central nervous system, making major contributions to the understanding of opioid tolerance. 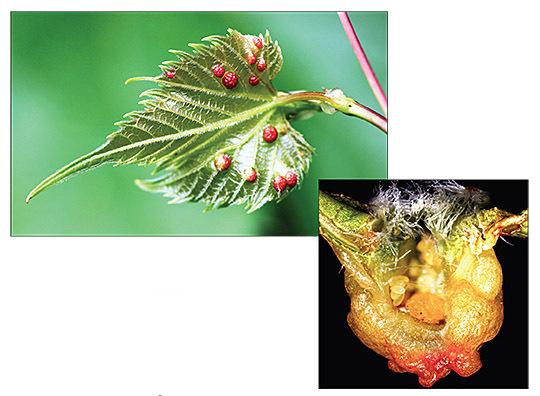 Pollack is a Fellow of the American Association for the Advancement of Science and a Fellow of the American Association of Pharmaceutical Scientists. 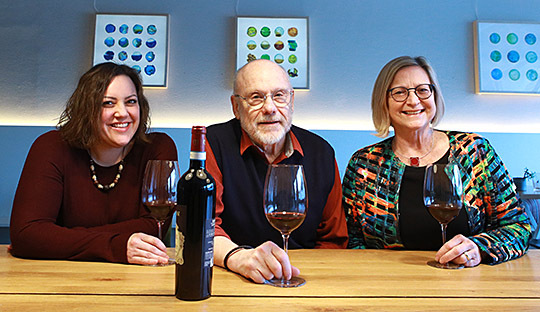 Pollack serves on the Editorial Advisory Board of the Journal of Experimental Pharmacology, and from 2002 to 2006 was associate editor of the Journal of Pharmaceutical Sciences. He also is a reviewer for numerous journals in his field, and is an ad hoc reviewer for the National Institutes of Health and the Health Effects Institute. Pollack earned his doctorate in pharmaceutics from the State University of New York at Buffalo and bachelor’s degree in chemistry/psychology from Knox College. Bjorkman also thanked Dr. Amanda Bryant-Friedrich, interim dean of the College of Pharmacy and Pharmaceutical Sciences, for her leadership during the transition. She will return to her role as dean of the College of Graduate Studies and vice provost for graduate affairs Aug. 15. Students, faculty and staff: You are invited to help select the 2019 University of Toledo Homecoming theme. • Rocky’s Haunted Homecoming — spooky fun. Go to the University involvement network website to vote. Just sign in with your UTAD information and help shape this year’s festivities. Tuesday, March 12, is the deadline to cast your ballot. There will be intermittent closures of the east and west parking garages during spring break week, Monday through Friday, March 4-8. “This will allow us to visually inspect and remove any loose concrete that might have cracked over this winter’s freeze and thaw cycle,” Doug Collins, director of grounds and off-site facilities, said. “This also will give us an indication of what repairs we will conduct during the summer closure of the structures,” he added. The east parking garage will be open for Toledo Rockets and high school basketball games that week. 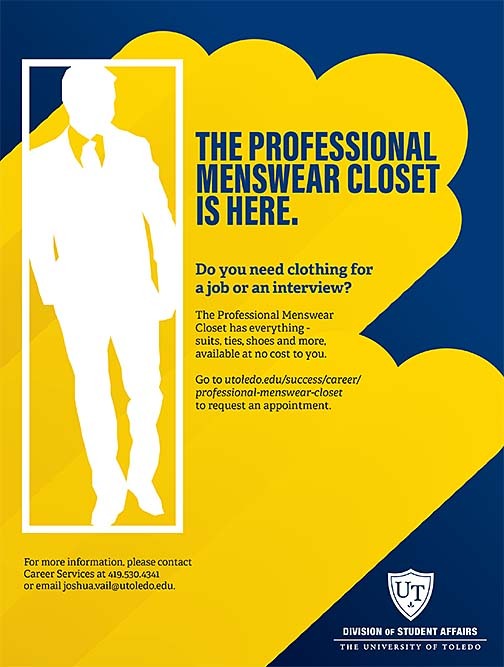 Career Services recently opened the Professional Menswear Closet. 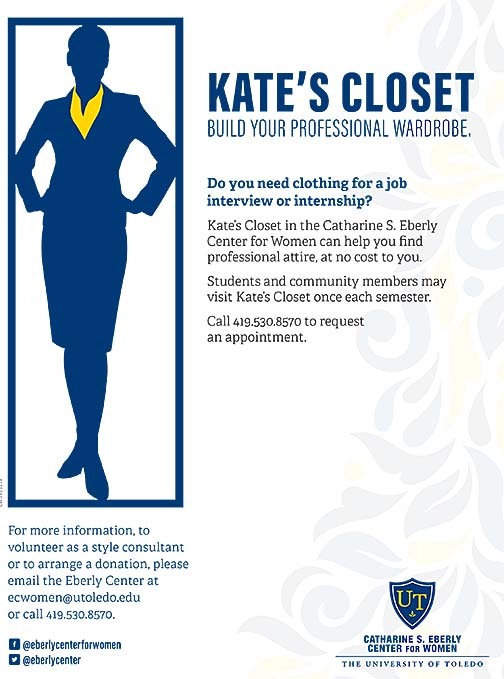 Now, in conjunction with Kate’s Closet, a service of the Catharine S. Eberly Center for Women since 2013, students have access to professional clothing — women’s and men’s styles — to prepare for interviews and internships, and to build their professional wardrobes at no cost to them. “We are excited to offer the Professional Menswear Closet in addition to the Eberly Center’s Kate’s Closet. By increasing our services and making sure all students have a source for business wear, we are aligning The University of Toledo more closely with national best practices and providing a solution for job fairs, interviews and other opportunities that arise, sometimes catching students unprepared in the clothing department,” Shelly Drouillard, director of Career Services, said. Both closets are welcoming, inclusive spaces and are LGBTQA+ friendly. Students who need menswear should go to the Professional Men’s Closet website or call 419.530.4341 to request an appointment. If women’s styles are what you need, call the Eberly Center at 419.530.8570 to set up an appointment. After your wardrobe is set, plan to attend the Job Fair Prep & Networking Night Tuesday, March 12, from 6 to 8 p.m. in the Thompson Student Union Ingman Room. Career Services and the UT Alumni Association will offer tips and facilitate networking. Students who need assistance with their resumés or Jobfest strategies should go to Career Services, located in Thompson Student Union Room 1533. Undergraduate drop-in hours are Monday, Thursday and Friday from 10 a.m. to 5 p.m., and Tuesday and Wednesday from 10 a.m. to 6 p.m.
For more information, contact Career Services at 419.530.4341. 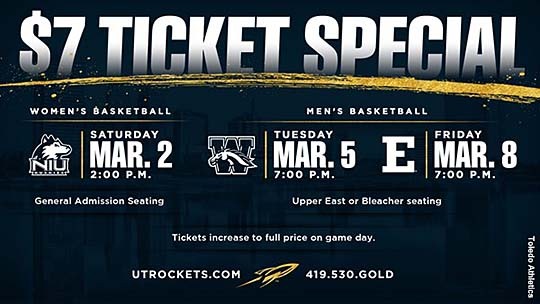 The Toledo men’s and women’s basketball programs will provide a ticket special to Rocket fans for three games over the course of the next two weeks. With the regular season quickly coming to a close, fans can sit in the upper east or bleacher seats of Savage Arena for $7, which includes parking, for men’s contests vs. Western Michigan Tuesday, March 5, and Eastern Michigan Friday, March 8. Both games will start at 7 p.m.
For the women, general admission tickets are available for $7, which includes parking, for a game vs. Northern Illinois Saturday, March 2. Tipoff will be at 2 p.m.
Tickets will increase to full price on the day of the game. To purchase tickets, stop by the Athletic Ticket Office in Savage Arena, go to the Toledo Rockets website, or call 419.530.GOLD (4653). University students are admitted free with ID. Due to a water line break, the South Dining Hall in the Thompson Student Union will be closed Tuesday, Feb. 26. Crews are working to identify and fix the issue. Other food court eateries in the Thompson Student Union will be open. Wednesday, March 13, is the deadline for female undergraduates to submit applications for the University Women’s Commission Scholarship. At least three $1,000 scholarships for the 2019-20 academic year will be awarded to female undergraduates who have earned 60 or more credit hours. Scholarship recipients and the Alice H. Skeens Outstanding Woman Award winners will be recognized at a luncheon Wednesday, April 10, from 11:30 a.m. to 1 p.m. in the Savage Arena Grogan Room. Scholarship application and guidelines can be found on the University Women’s Commission website. For more information, contact Kelly Andrews, senior associate athletics director/senior woman administrator in Intercollegiate Athletics, who is chair of the commission, at kelly.andrews@utoledo.edu. 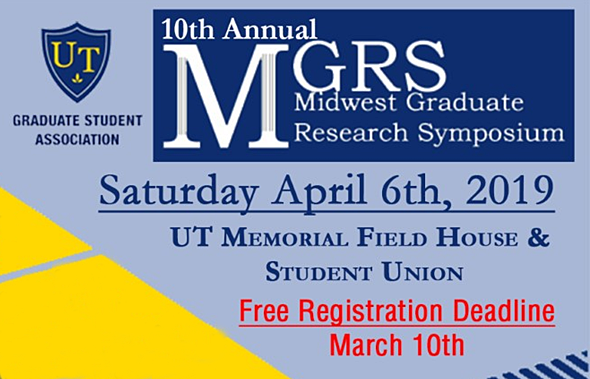 The University of Toledo Graduate Student Association will host the 10th annual Midwest Graduate Research Symposium Saturday, April 6, in the Memorial Field House and Thompson Student Union. Students will represent a variety of disciplines and compete for awards and monetary prizes at the symposium. “This event invites more than 90 universities across the Midwest and surrounding areas, offering an opportunity for all graduate students in the region to have their work presented as seminar or poster presentations,” said Alisa Nammavong, president of The University of Toledo Graduate Student Association. The symposium is open to all majors and is great for networking opportunities, according to Nammavong. Charlene Gilbert, dean of the College of Arts and Letters, and professor of film, will give the keynote address at the event. Sunday, March 10, is the deadline to register for free; go to the Graduate Student Association website. For more information, email graduatestudentassociation@gmail.com.